Anthony Kappes and pilot Craig MacLean won GB's fifth cycling gold at the Velodrome after beating team-mates Neil Fachie and Barney Storey to win the tandem sprint. The victory was sweeter for Kappes and Olympic silver medallist MacLean after they failed to finish Saturday's kilo, won by their British rivals, because of a mechanical problem. It was a second tandem sprint title in a row for Kappes who had been partnered to glory by Storey in Beijing four years ago. 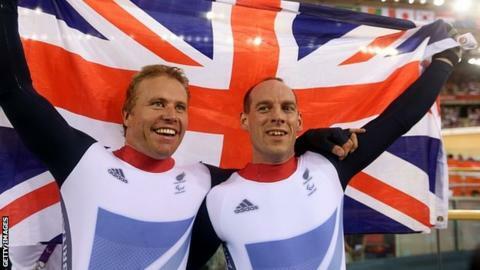 Britain won five gold seven silver and three bronze to top the track cycling medal table ahead of China. "You don't get many opportunities," said Kappes. "Yesterday we blew it; it was not our fault, still we blew it nonetheless. "Today was a chance to demonstrate what we can do and I can't complain." GB also won silver in the team sprint with Darren Kenny, Jon-Allan Butterworth and Rik Wadden, while Aileen McGlynn and Helen Scott won bronze in the tandem pursuit, edging out team-mates Lora Turnham and Fiona Duncan. Kappes and MacLean signalled their intent in the morning qualification with a new 200m flying lap world record of 10.050 seconds, beating the 10.165 set by Fachie and Storey in the ride before to move straight into the semi-finals. In the final, the partially sighted Kappes and MacLean led from the start to win the first race in the best-of-three series. In the second race, Fachie and Storey led off the line and kept a close watch on their rivals in a slow, tense build-up. As the pace quickened, Kappes and MacLean swooped from high up and the two teams had a brief coming together towards the end of the penultimate lap. Fachie and Storey sat up and Kappes and MacLean powered away to secure gold. MacLean, who won Olympic team sprint silver in Sydney in 2000, added: "It would've been nice to be celebrating the double, but I suppose we've redeemed ourselves a little bit. It's always nice to win." Storey said: "We just had a little collision at the end of the back straight. It sometimes happens in tandem sprinting. "It wouldn't have really changed the result today." Fachie, who gestured in frustration, added: "We lost balance and that was the race done. Those guys were better than us today. They came out after yesterday's disappointment and showed what they could do."